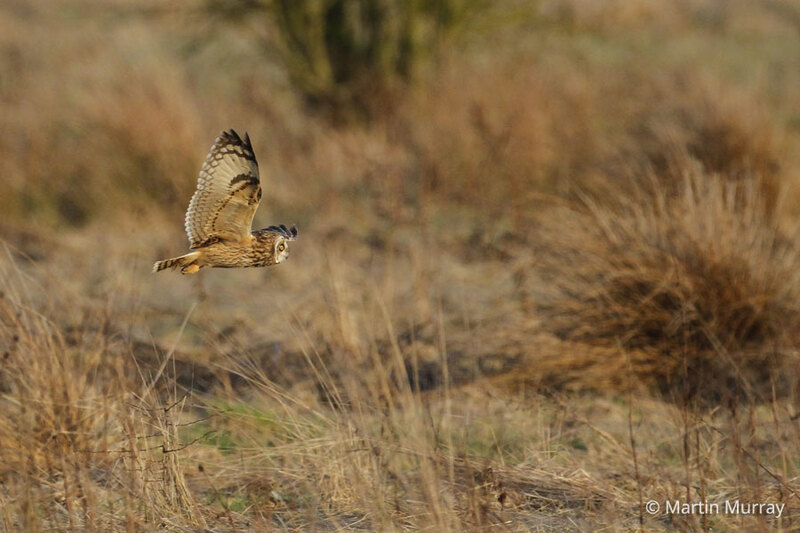 Short-eared Owls are quite skilled at finding areas that have very high numbers of prey. Once a site is found, many individuals will gather together in the area. If the food is plentiful enough, individuals may even decide to nest there rather than return to their traditional nest sites. When the male is trying to attract a female, he will engage in some beautiful courtship displays which are visual and audible treats! One of his courtship flights includes wing clapping. 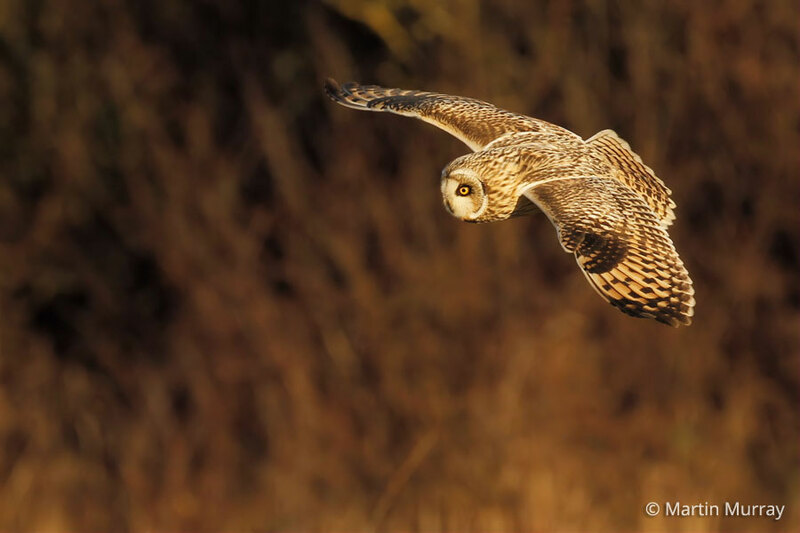 Short-eared Owls don't only use their strong flight skills for hunting. They are able to fly long distances - even over the wide open ocean. Some people have reported observing Short-eared Owls landing on boats many hundres of miles from any land mass. In years when prey concentrations are high, one Short-eared Owl female may lay as many as 14 eggs in a single clutch. The Peregrine Fund is not working directly with Short-eared Owls, but our conservation efforts through habitat protection, education, and community outreach extend to all raptor species, including this owl. 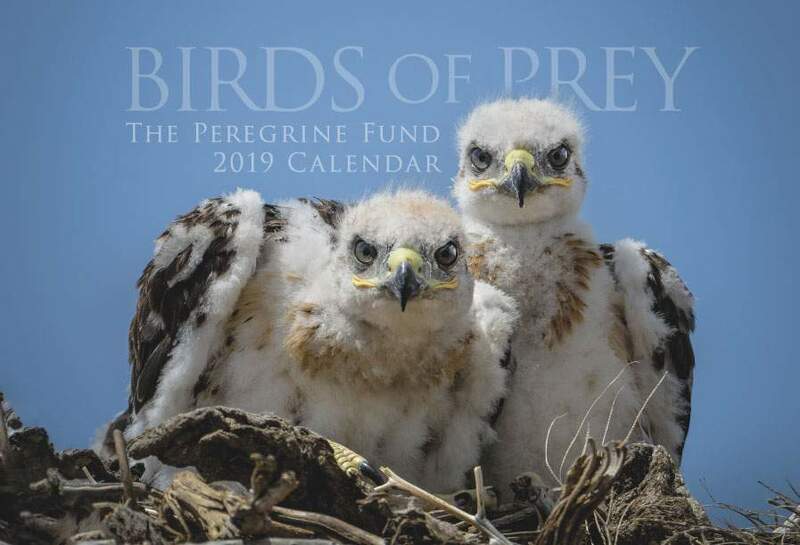 We also supply literature to researchers from our avian research library, which helps scientists around the world gather and share important information on raptor conservation. In company with the Peregrine Falcon and the Osprey, the Short-eared Owl is one of the most widely distributed birds in the world. It is found on every continent except two: Australia and Antarctica. In fact, no birds of prey at all are found on the latter continent! It is also found on a number of islands and island chains including Iceland, Hawaii and Galapagos. Apart from being widely distributed around the world, the Short-eared Owl also lives in a wide array of open country habitats with scattered vegetation - as long as there is plenty of prey nearby to sustain it. The Short-eared Owl has been documented in meadows, rangelands, grasslands, cultivated fields, heathlands, tundras, moors, marshes and other similar habitats. It has even been found living quite comfortably in city parks and even golf courses. In some parts of its range, scientists have documented Short-eared Owls moving into once-forested areas that had recently been cleared. The Short-eared Owl is a nomadic species - meaning it tends to move around quite a bit. For its survival, it needs to make sure there is plenty of prey around for it to feed on. When prey numbers are low in a certain area, or during a certain time of year, this owl can't afford to to sit idly by and wait for prey to appear. It needs to migrate or move to locations with more options for rustling up a good meal. Scientists believe that during years when prey is abundant, at least some individual Short-eared Owls won't migrate at all. Instead, they will stay put to take advantage of the local food source. The Short-eared Owl gets its name because of the very short ear tufts on its head. These are not actually the bird's ears, but they do resemble the pointy ear structures of some mammals. Unlike the Long-eared Owl, the Short-eared Owl's ear tufts aren't usually visible. They are usually sitting flat on the head, so they can often go unnoticed. However, if the owl is excited or alert it will often raise the feathers around its head. That is when the famous "ears" become visible - even though they are so small, even then they can be hard to see without binoculars! Though its ear tufts might be small, this medium-sized owl has quite large yellow eyes which are surrounded by black feathers - this really makes its eyes stand out. It also has a relatively large head. The Short-eared Owl has a black, curved beak and its body feathers vary in coloration from creamy beige to brown, and are mottled. There is quite a lot of darker streaking on its upper breast. All of these colors help it blend into its surrounding, providing it with nice camouflage when it is on the hunt or roosting. Another interesting feature of the Short-eared Owl is its noticeably dark brownish facial disk. Just about now you might be asking yourself what a facial disk is. 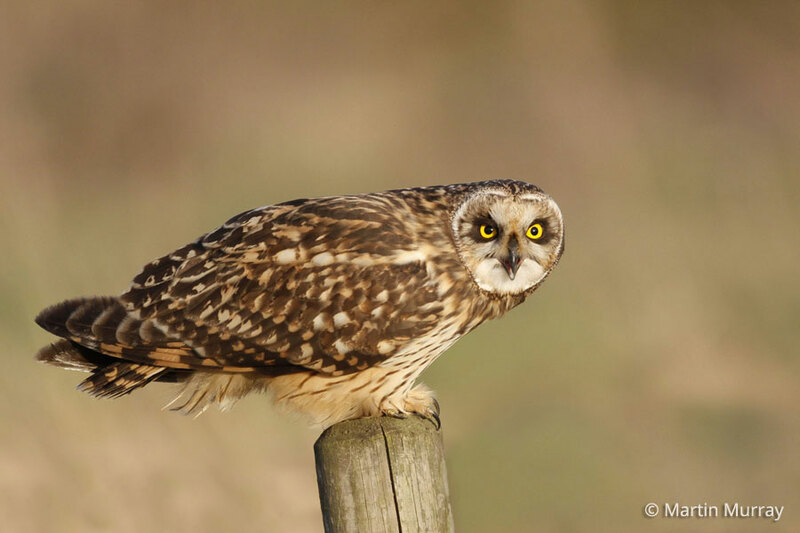 Short-eared Owls, like most other owls, have one! The facial disk is composed of feathers which grow around the owl's head and help direct sound to the bird's ears. To get an idea of how it works, cup your hands behind your ears and listen – sounds will be louder and clearer. Owls can raise their disk feathers slightly when on the hunt, allowing them to hear the rustle of a rodent in the grass or even one scurrying beneath the snow. But the facial disk isn't the only characteristic that gives this owl such an amazing ability to hear. Short-eared Owls, like other owls, have asymmetrical ear openings. This means that one ear opening is located higher up on one side of the head, while the other ear opening is located lower on the other side of the head. There can also be one ear opening that is a bit farther forward on the head while the ear opening on the other side of the head is a bit farther back. The ear positions can be any combination of high, low, forward, and back! This helps owls better triangulate sounds, thus making finding prey that much easier. This owl flies with lovely undulating wingbeats and its flight pattern has often been compared to that of a moth. Though the Short-eared Owl isn't the most vocal of species, it does have a number of different calls including a hoot, a "bark" which sounds like the yapping of a tiny dog, and what can best be described as a "whine." Females will sometimes make clucking noises, too. 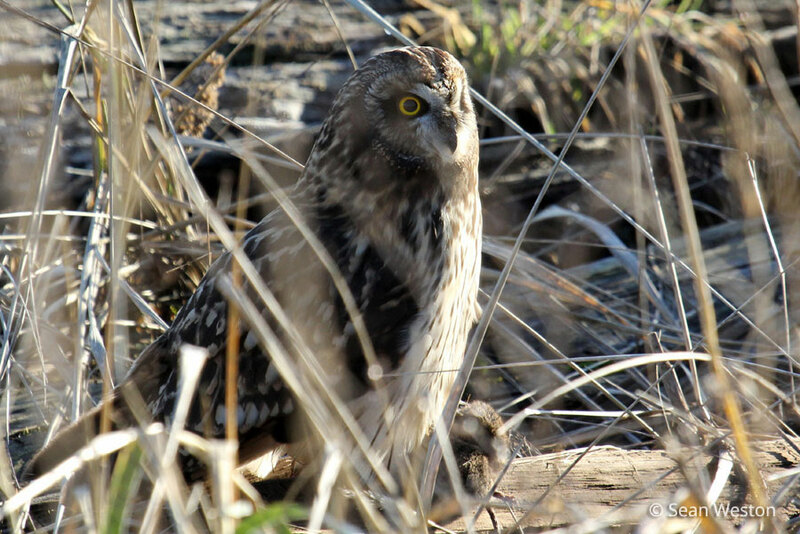 If you are out hiking in Short-eared Owl territory and think you hear a chicken - you might actually be hearing a female Short-eared Owl instead! Unlike most owls, the Short-eared Owl is often seen during the day - especially at dawn and dusk, its favorite times go on the hunt. Though scientists are uncertain about the current Short-eared Owl population numbers, it appears that they are declining in some areas throughout their range, while remaining stable in others. The Short-eared Owl is particularly vulnerable to habitat loss, fragmentation and alteration. 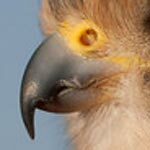 They rely on large expanses of open habitats in order to nest and hunt. Habitat conversion to housing developments, businesses, livestock pastures, and other uses can have a detrimental affect on this species. If you are a mouse or a vole living in Short-eared Owl country, you need to be very careful. 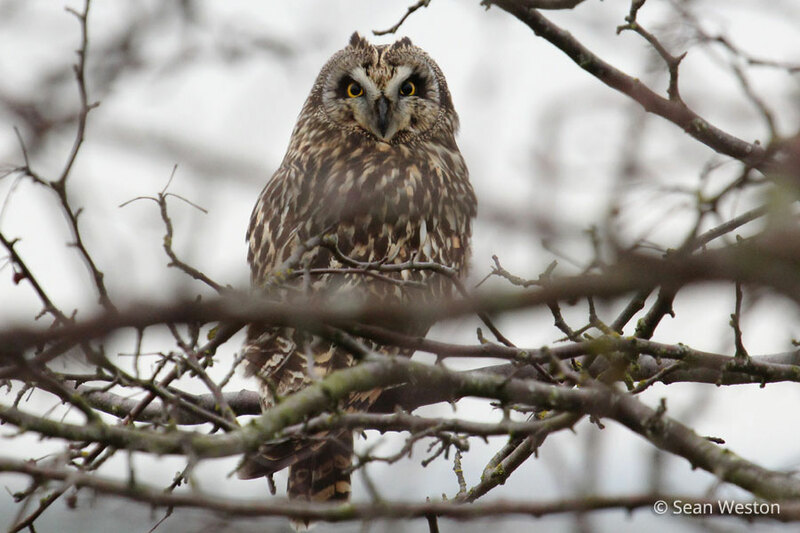 Short-eared Owls are tireless hunters and will patrol open fields in search of food. They can often be seen gliding almost effortlessly and silently on their round wings looking and listening for any movement that signals prey is nearby. Though the Short-eared Owl seems to have a particular taste for voles, it will also predate on shrews, moles, rabbits, and bats. It will also eat a wide variety of birds including terns, gulls, shorebirds, and songbirds. Scientists have found that it will often remove the head and guts of their mammalian prey and remove the wings of their avian prey before swallowing them whole. Any other undigestable bits - such as fur, feathers, bones, and claws are then regurgitated in the form of a pellet. Finding an owl pellet is a great way to get solid clues about what it has been eating. Unlike the Barn Owl, the Short-eared Owl is a ground nester. The female will lay usually 4-9 eggs, but sometimes more, in a scraped-out depression on the ground which has been lined with grass and feathers. They will occassionally nest in the same exact area year after year, constructing a new nest on top of the old one. The female is responsible for incubating the eggs, which does for around 24-29 days. Even though the nests are placed in areas with enough vegetation to help conceal them, as you can imagine, nesting on the ground would make the female, her eggs and her young vulnerable to a large number of predators. Perhaps because of this, the female is hard to flush from the nest. She does her best to hold her ground in the face of a threat, to make sure her young are safe. If she is flushed (made to fly) from the nest, she might defecate (or poop) on the eggs before flying. Scientists think the smell might help deter predators from eating the eggs. But the female isn't the only one who protects the nest and young. Males also play an important part. They will try to distract other predators away with vocalizations or movements. The male is also responsible for bringing all of the food for her and, once the chicks hatch, for his offspring as well. The young leave the nest at 14-18 days but this doesn't mean they are ready to fly yet. They will first begin walking around on the ground exploring their new surroundings. The young will fly for the first time when they are usually between 24-27 days old. The fledglings may all band together in social groups and roost together during the day. These owls are able to reproduce in their first year. According to the Idaho Department of Fish and Game, the short-eared owl is considered a common resident throughout the southern part of the state, wherever suitable habitat exists. As mentioned, some individual Short-eared Owls are nomadic, meaning they don't stay in one place all year-round, but tend to move based on where there is the highest concentration of prey. The population in Idaho is no exception. Also, some individual Short-eared Owls travel south in the colder winter months. 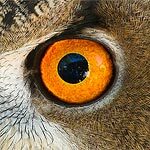 The visitor center at our World Center for Birds of Prey has owls among its avian ambassadors, including a Eurasian Eagle Owl and a Western Screech Owl. This is a great chance to see owls up close and learn about the wonderful and interesting adaptations they have in order to survive in their respective habitats. There is also a touch table with owl feathers and other natural objects available for exploration. 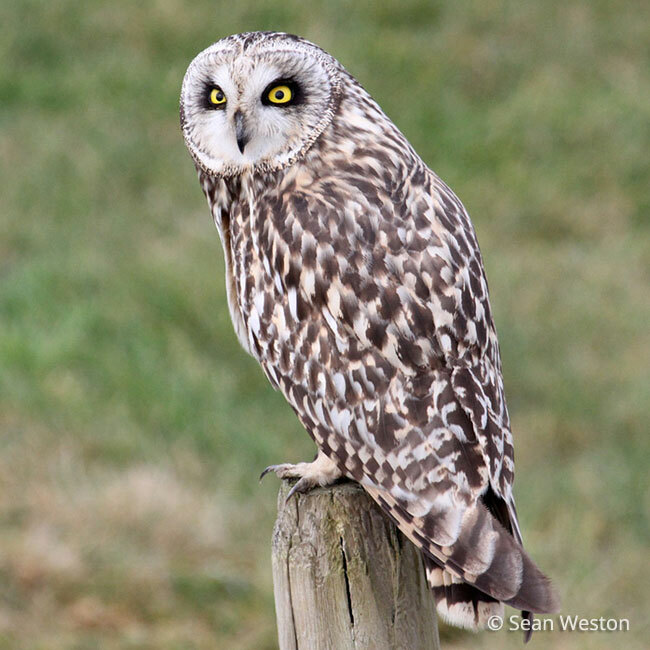 Our knowledgeable staff can help answer any questions you may have about Short-eared Owls or any other bird of prey.